Funny card of a ladybug and the text: " I am buggy for you". 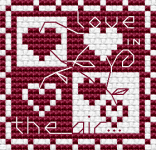 Cross stitch pattern for coffee lovers with text: "Tho hearts One Love"
On Valentine's day will a good goose lay, If she be a good goose, her dame well to pay, She will lay two eggs before Valentine's day. Valentine's Day pattern depicting an open envelope with hearts. 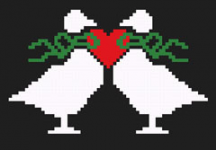 Cross stitch motif of a duck couple on a dark background. 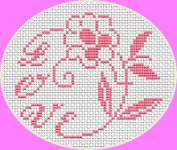 Vintage cross stitch pattern with flowers and the text Kissin' Don't Last. 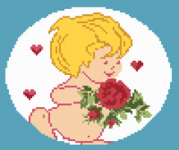 Cupid holding a bouquet of roses. 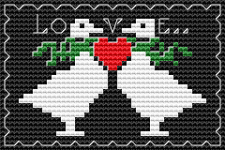 Stylized cross stitch pattern of a flower and the word "Love"
Decorative pattern of a duck couple in love. If it walks like a duck and quacks like a duck, you can be reasonably sure it is a duck!